Sometimes technological serendipity strikes just when needed. My wife recently received an iPad as part of her professorship at a state college. 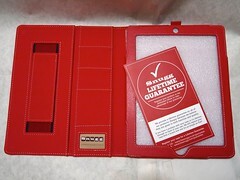 As all good IT departments should, they provided the iPad with a cover to offer some protection, since it was going to be used in the classroom and also on-the-go. That said, I had some major issues with the case. First, the cover didn't fold behind the iPad like most others do. the cover would hang open whenever you used the iPad. It also had no way to stand up the iPad in landscape mode to use on a desk or countertop. 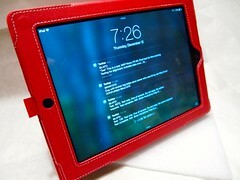 Thankfully, the folks over at Snugg (http://thesnugg.com), seemed to feel my angst and contacted me out of the blue via email to offer a free IPad case to review. 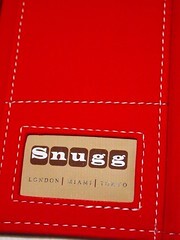 After looking through their extensive catalog of covers for through their catalog -- which contains covers for all sorts of smartphones, Kindles and tablets as well as the iPad -- I settled on the Snugg iPad 3 Executive Case Cover and Stand in Red Leather. I tend to buy my device covers in high-visibility colors so that that they are easy to see and find no matter where I might be. 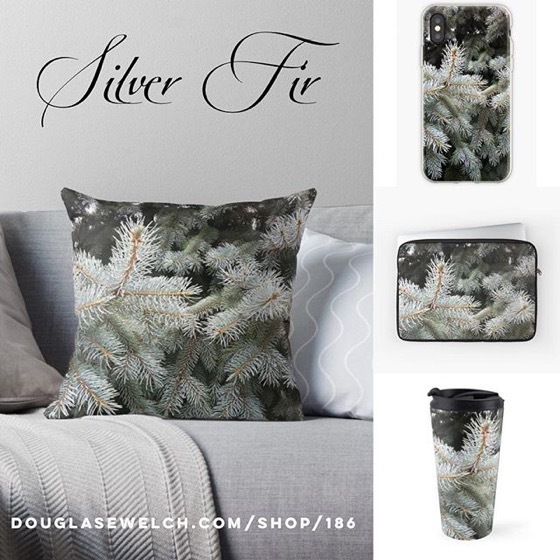 Often, with black covers (like the one my wife was provided) I have trouble finding it in dark rooms or in our briefcases and bags. So, just like the cover for my Kindle Fire, this one is bright red and stands out quite nicely. 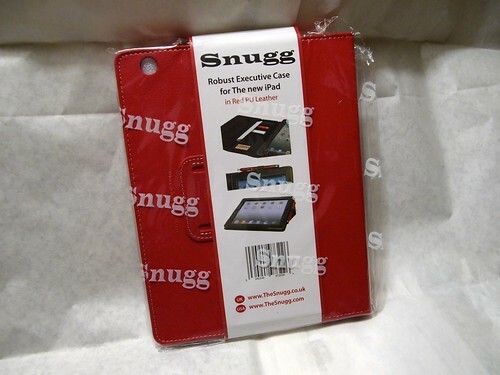 The Snugg iPad 3 Executive Case Cover and Stand corrects all the problems I had with the previous cover. 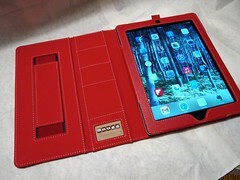 It operates as a "smart cover" -- meaning the iPad wakes up and shuts down when you open or close the over. The magnetic closure is firm and easily keeps the cover shut when not in use. The top flap of the cover folks completely flat against the back when using the iPad. There is also a catch on the back of the cover that captures the front cover and turns into a nice, stable stand for using the iPad on the desktop. An additional feature I haven't seen in many other covers is the elastic strap that allows you to insert your hand and firmly hold the iPad for use when standing or presenting to a classroom. For me, anything that helps to prevent dropping the unit is great thing. The construction of the case is top rate. The material seems very durable and pleasant to the touch. The stitching is even and tight. The average tech geek might not notice such things, but I understand how important the construction is to longevity and usability, so it is something I look for in nearly everything I buy. All the ports in the case -- camera lens, charging port, mute and volume are well-positioned and allow for easy access. This is great as you don't want to be constantly fighting with the case as you use it in various ways during your day. 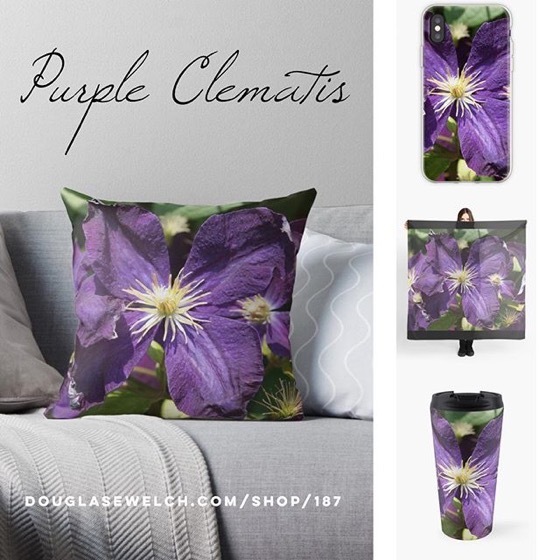 Finally, a couple of nice small features include a folder pocket for receipts, plane tickets and other materials, as well as 4 pockets for credit cards, business cards or whatever else you might want to keep with your iPad. After a week or so of surface, it looks we are both going to be very happy with the cover and I would recommend Snugg covers for your future needs, too.